ORLANDO, Florida - Two Germans on a burning ship located far out sea were rescued by the U.S. Air Force 920th Rescue Wing throughout Friday and into the early hours of Saturday. The U.S. Coast Guard's Seventh District in Miami, Florida requested assistance from the Air Force in the long-range search and rescue after it was learned that the vessel had caught fire approximately 500 nautical miles off the east coast of southern Florida. “The rescue was a culmination of skill and teamwork that involved many throughout the 920th RQW, the Coast Guard, The AFRCC and the 45th Space Wing, who provided critical support to allow our aircraft to launch and recover,” said Col. Kurt Matthews, 920th RQW Commander. “The specific capability with our Guardian Angel Airmen, combined with our air refueling and extended-range airlift makes us uniquely able to accomplish this mission where few others in the world can. I’m very humbled and glad to be a part of this noble mission,” said the commander. It was discovered during the planning stages that only one of the German victims spoke English, but was badly burned, therefore Master Sgt. Isabelle Kleirgraham, 920th RQW Equal Opportunity noncommissioned officer, was tasked to join the team due to her ability to speak fluent German. The team arrived on scene two hours later and orbited overhead while King Ops (39th Rescue Squadron) at Patrick Air Force Base communicated with the ship, the Nord Nightingale. “We had the life boat in the water and the freighter was about 2 miles away,” said Captain Dan Morgese, aircraft commander. 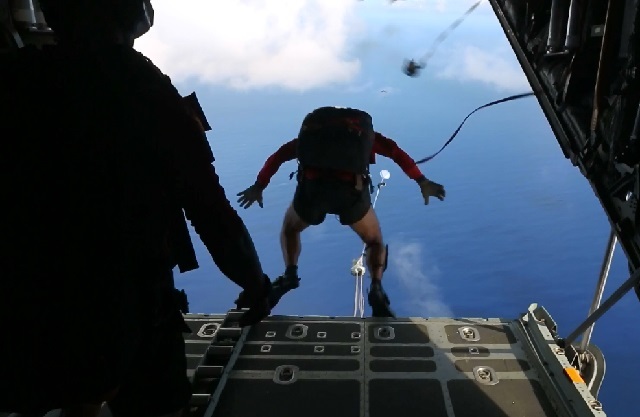 Finally, five pararescuemen plunged into the ocean. The Nightingale motored a small boat toward the victims, which allowed the pararescuemen to hoist the 48-year-old and 66-year-old father-son duo onboard while several of the other Rescue Airmen zoomed over to pick up the parabundles of medical equipment that splashed down just after them. Around the same time the HC-130 arrived on scene, two HH-60G Pave Hawk helicopters departed Patrick with full tanks of gas to retrieve everyone and transport the victims to Orlando Regional Medical Center. According to an Air Force fact sheet, an Air Force Pave Hawk can fly approximately 500 miles on one tank of gas, the approximate distance to the scene. To top off their gas tanks, the helicopters met up with the HC-130 on its return to Patrick for aerial refueling. About an hour later, an additional HC-130 took off from Patrick to serve as fuel reserve for the helicopter's return trip. The pararescuemen treated and stabilized the patients, then transferred them to the Nightingale to be picked up by the inbound helicopter.